Today is another edition of #SundaySupper. Since today is not only Easter it’s also Lemons and Oranges Day! So to celebrate Mother’s Nature beautiful citrus fruit, we had to make a dish with what else lemons or oranges. 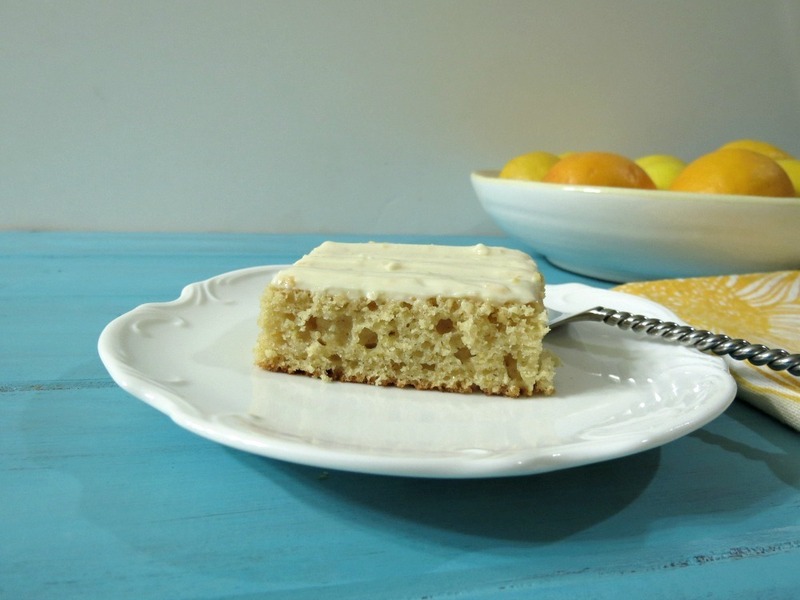 Today’s dish is a fabulous snack cake made with Meyer Lemons that my friend Marty gave me. I couldn’t believe how wonderful a Meyer Lemon tasted! It is so sweet!! Yes a sweet lemon! Crazy!! But it’s so good and because it’s so sweet I cut back on the sugar in my recipe! Yah!! 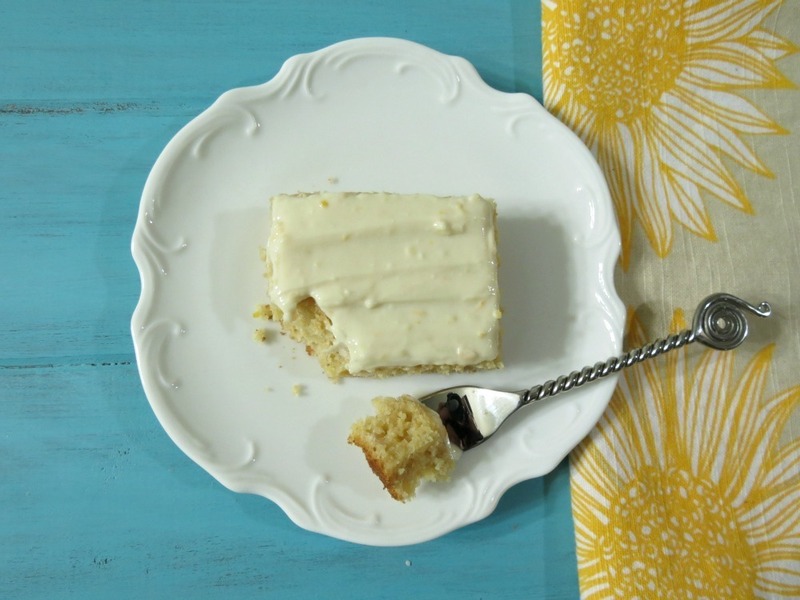 Oh and today’s recipe is a Meyer Lemon Snack Cake with Lemon Cream Cheese Frosting. 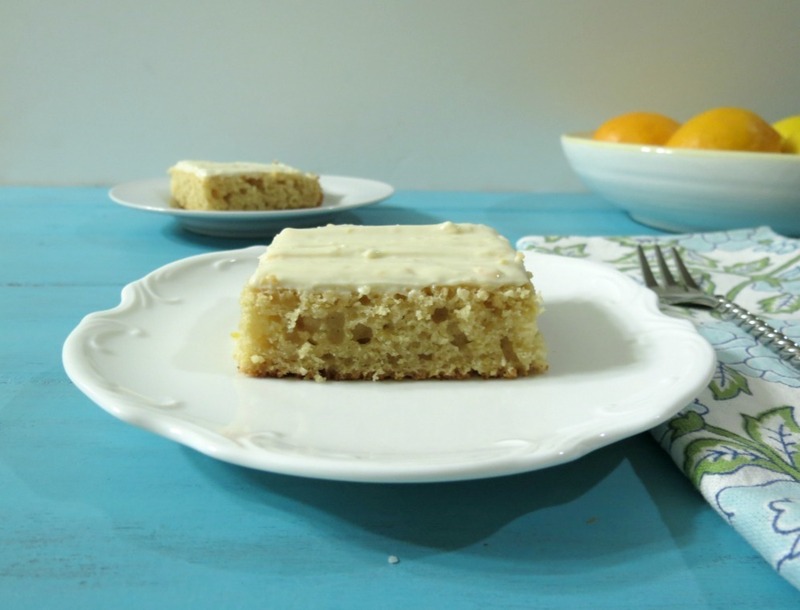 This cake is so light and fluffy and has the most wonderful lemon taste and then topping it with a cream cheese frosting that has fresh Meyer lemon juice in it, oh man! I was totally licking the bowl on this one. I was pretty impressed on how light the cake was considering I didn’t use any oil in it, but I did use vanilla yogurt which adds a nice moisture to it! This recipe makes 12 nice slices of cake and to top it, it’s guilt-free! A slice of cake with frosting is only 137 calories! Which is so perfect!! I brought this dish to work and I was surprised on how much of a hit it was. I wasn’t sure how it would go over considering I made it on a Saturday night and took it to work on Monday. I did ask my pals on Facebook on how to store the cake. I didn’t know if I could keep it out or put it in the refrigerator. They said to put it in the refrigerator, but it will affect the texture of the cake, but your safe to know the frosting, being dairy, wouldn’t make anyone sick. I’d rather be safe then sorry! After taking it out of the refrigerator, about an hour on the counter the cake turned out perfect. It wasn’t quite as light as the day I made it, but it was still very good and was eaten up pretty quick!! So if you do make it or make anything with a cream cheese frosting, be sure to refrigerate it! Or leave the cake out and put the frosting in the refrigerator and frost your cake when your ready to serve it!! 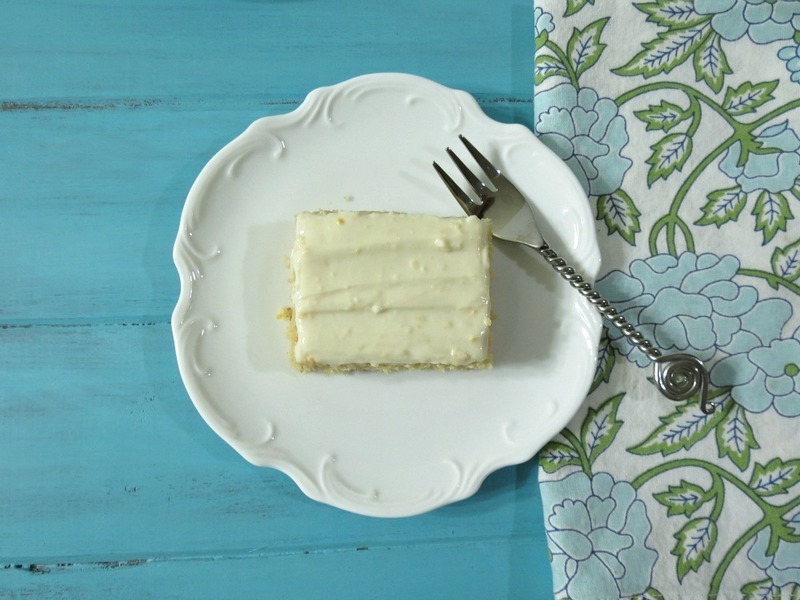 A light, healthy lemon flavor cake topped with a lemon cream cheese frosting. Spray an 8 x 8 pan with cooking spray; set a side. In a medium bowl, combine flour, sugar, baking powder and salt; set aside. In a large bowl, combine egg and lemon zest. Add melted margarine, yogurt and milk; mix well. Add flour mixture to egg mixture and stir until combined. Pour batter into prepared baking dish. Bake 30-35 minutes or until toothpick inserted in center comes out clean. Cool completely. In a large bowl add cream cheese, 3 tablespoons powdered sugar, vanilla extract, 1½ tablespoons lemon juice and lemon zest and beat until light and creamed; about 3 minutes. Spread frosting over cooled cake. Top each serving with lemon zest, if desired. I hope you have a wonderful Easter or a great Lemons and Oranges Day! Be sure to check out what other citrus dishes that the #SundaySupper has made! Join the #SundaySupper conversation on Twitter on Sunday, March 31st to talk all about citrus recipes! We’ll tweet throughout the day and share recipes from all over the world. Our weekly chat starts at 7:00 pm EST. Follow the #SundaySupper hashtag, and remember to include it in your tweets to join in the chat. Check out our #SundaySupper Pinterest board for more delicious recipes and food photos. I was wondering, if you don’t have pastry flour, would regular whole wheat flour be okay instead? This looks so good!! I absolutely love lemon. Hi Samantha! I would use 1/2 cup whole wheat flour and 3/4 cup all purpose flour in the recipe. I found using all whole wheat flour in baking can make your baked goods a little heavy or dense. Have a great rest of the weekend!! Now this is my idea of a snack cake! Lovely! I love how light this is! Another winner! I love the props with the blue and yellow…makes your pictures just pull together so nicely. Your cake sounds heavenly too! Sounds soooo good! Yummmm! I could go for some right now! I’m digging the light and airy texture (it looks that way in the photos). So nice for a treat when you want something sweet but not heavy. A keeper recipe! Thank you Renee!! It is a pretty light cake and I love that! Under 140 calories?! Amazing! That means 2 pieces is acceptable right? Only 137 calories including cream cheese frosting… love it!!! 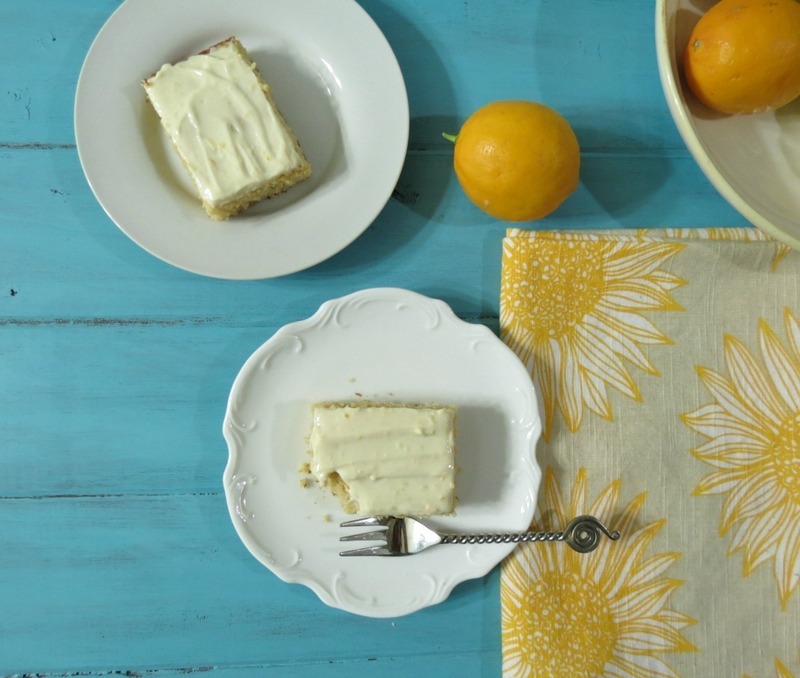 What a great recipe, and love the colors in the fabrics in these pics- just plain pretty! Ahh thanks Diana!! The cover of the new Williams and Sonoma magazine is yellow and blue and I just love it!! One of my favorite color combos. It sure it, it’s actually not that bad for you!! Like that they are nice normal cake slice sizes! A snack cake with a little bit of everything that I love! Lemon, especially meyer, whole wheat flour and yogurt, such a wonderful recipe. Thanks Paula! Loving the Meyer Lemon!! Mmmm, this time of year, I simply crave citrus. Your cake looks perfect! Me too! I have been on a major citrus kick lately! I can’t get enough! Love the yogurt in this, looks so moist! Thanks Sarah! This is a very light cake, which kind of surprised me, and i”m happy with this surprise! Seriously yummy cake. I love meyer lemons way too much. This is perfection. Thanks Kim! Love Meyer Lemons too! First time I ever had them and LOVE them! Oh yah the vanilla yogurt would be great and if you wanted to zip it up a bit, use lemon yogurt! Thanks Anne! I’m glad it worked out too! yummm ! looks lovely !